Move quickly and dominate on the court wearing the Asics Club ladies tennis tank top. This fitted, sporty top ensures ease of movement thanks to a lightweight and stretchy knit fabric and for excellent moisture control and a dry skin feeling, it features Asics Motion Dry technology. The top guarantees a slimming effect and has a mechanical back vent peep hole to provide extra ventilation. It is produced from polyester (92%) and elastane (8%). for submitting product information about Asics Club Ladies Tennis Tank Top We aim to answer all questions within 2-3 days. 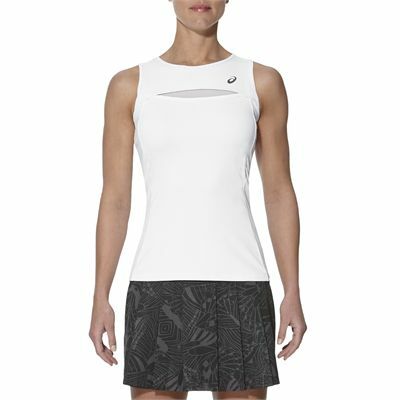 for submitting product information about Asics Club Ladies Tennis Tank Top. We aim to answer all questions within 2-3 days. If you provided your name and email address, we will email you as soon as the answer is published. for submitting product review about Asics Club Ladies Tennis Tank Top.